Hollywood & Highland is the entertainment center of Los Angeles for tourists and locals alike. Steps away from landmarks like the world famous Walk of Fame and TCL Chinese Theatre (formerly Grauman’s), Hollywood & Highland is the perfect place for a Hollywood beginning. With world-class shopping and dining, red carpet movie premieres and celebrated live theater, it’s the ultimate entertainment destination. 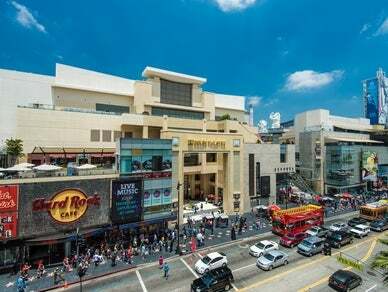 Steeped in Hollywood history, this iconic destination also features the Dolby Theatre, home of the Academy Awards® and over 70 brand-name retailers from Sephora, Victoria’s Secret and MAC to quintessential California stores like Hot Topic, Skechers and Lucky Brand Jeans. Visitors can enjoy 25 full-service and fast-casual restaurants such as Hard Rock Cafe, Dave & Busters, Cho Oishi, Trastevere Ristorante Italiano, California Pizza Kitchen, Cabo Wabo Cantina, and nightlife at Lucky Strike Live and OHM Nightclub. Restaurants and entertainment hours may vary. Receive a FREE VIP ACCESS card! In the city called home by celebrities and VIP's of all stripes, VIP ACCESS is key to the Angeleno experience! Our new VIP ACCESS card offers exclusive savings and complimentary items at Hollywood & Highland's popular eateries, shops and entertainment venues. To receive a free VIP ACCESS card just present your ID to the LA Visitor Information Center located on level 2 between the Dolby Theatre entrance and Starline TOurs. Visiting tour groups please contact our Marketing Department at 323.817.0208 or hhinfo@cimgroup.com to have VIP ACCESS cards prepared in advance for your group's arrival. Present your ID to the LA Visitor Information Center on level 2.